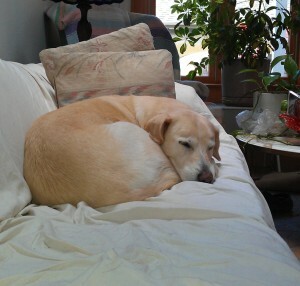 Sammi is a 13 year old Yellow Lab mix that we adopted from the CNYSPCA. She’s been a lot of fun and an awesome friend for more than a decade, and weighed about 70 pounds when healthy. She was down to about 55 when she was sick with Lyme Disease, could hardly walk and wouldn’t eat any food – canned or dry. With antibiotics, a thyroid supplement and this recipe, she came back from almost dead, and is her old self again. She said something I’ll never forget: “Regardless of what it says on the label, if it was really “human quality food”, it would be at Price Chopper or Wegmans, not here.” That really hit home. It’s absolutely true. No sane business would sell something for $1 a pound when they could get $3 for it. That’s when I decided that Sam was worth an extra money and effort and deserved real food. PS. If you need a great vet, give Jesse Shayvitz at Quarryside Animal Hospital a call. She’s really nice, extremely sharp, loves animals and picked right up on Sammi’s Lyme Disease and Thyroid when our previous vet missed it. PPS. If Pet Supplies Plus management is reading this, please don’t reprimand your employees for the above advice. It was very welcome. Sammi wasn’t eating, and the advice saved her life. Most places have employees that know nearly nothing and even if they do know, don’t care. I shop at Pet Supplies Plus because the employees actually know what they’re talking about and care about the animals. 5 Liter/Quart polycarbonate (clear plastic) food container with lid. Don’t use polyethylene (opaque white plastic like Tupperware) because the fat in the meat bonds with the plastic and makes it nearly impossible to clean. Put the rice in the rice cooker and start. Don’t rinse before or after cooking. Brown the ground beef in the large pot, and crumble. 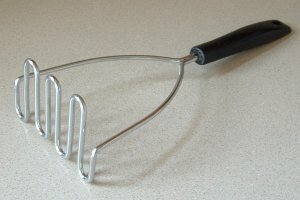 A wire potato masher works nicely. Place the large strainer over a large bowl, add all the ground beef to the strainer and let drain. When the rice is done, dump the drained ground beef into the large pot, then dump in the cooked rice. Mix until thoroughly combined. Let the cooking liquid from the beef separate, the discard most of the fat. Pour the rest over the beef/rice, and mix. Place in 5 quart plastic covered container and refrigerate. Fluff up the food, and scoop out 1.5 – 2 cups and put in dog bowl. 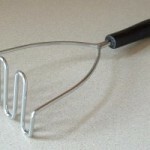 Add hot water to make the mix soupy and stir with fork. The extra water makes it easy to eat and gets extra water into your dog. Feed the above three times a day to build or maintain weight. Note: Wait for the drained grease to solidify in the bowl and then discard in trash or save for other uses. Don’t pour the grease down the drain, or you’ll be calling the plumber in a few weeks.